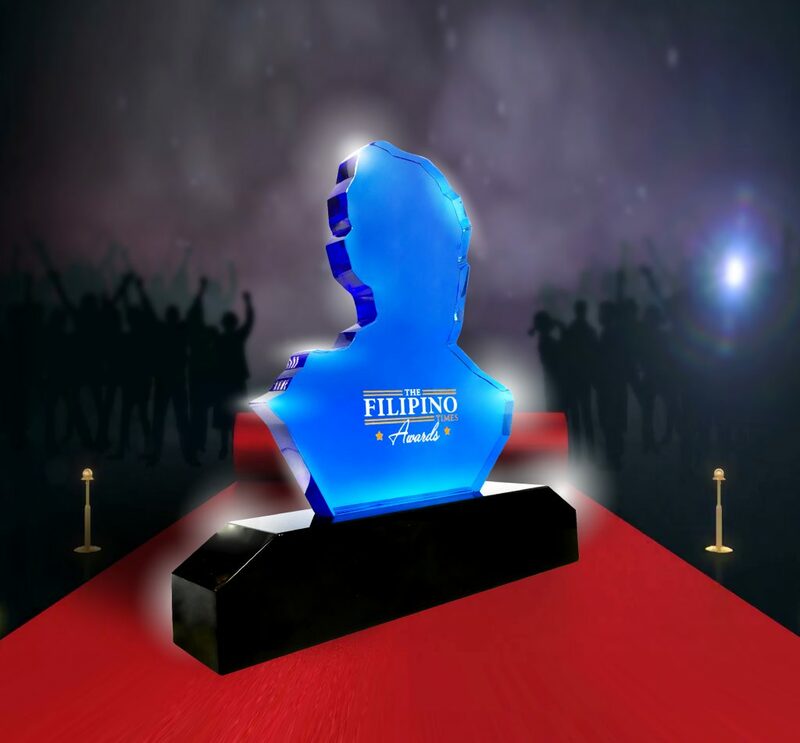 Today is a big day for the nearly 300 nominees for this year’s much-awaited The Filipino Times Awards, a glitzy red-carpet event to be held at JW Marriott Marquis in Dubai. Dubai-based Roxanne Gahol is Manager for Media Planning at OMD UAE. Originally born in Bahrain, Gahol has worked with international brands such as Apple Inc., McDonald’s, and Infiniti. Arnold “Nicholo” Jallores is a Social Media Manager at Amber Communications. 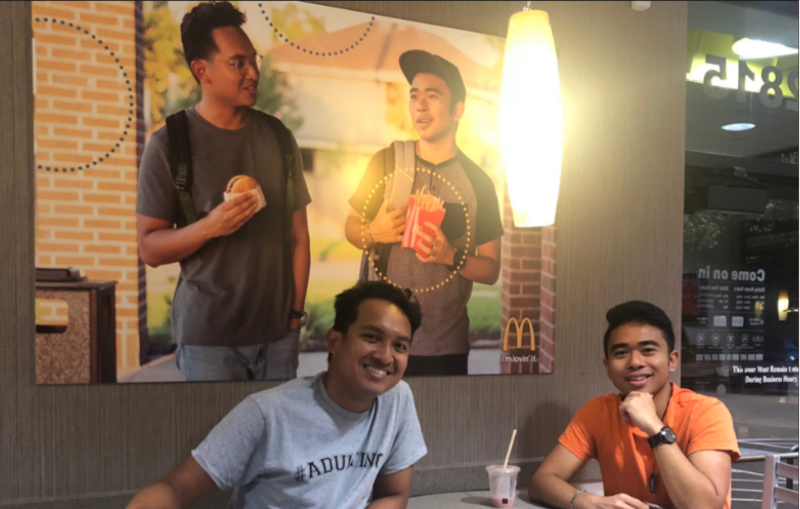 Originally from Manila, Jallores currently resides in Dubai and had managed the social media for big brands such as Nikon Middle East, Nikon Africa, and Baskin Robbins. Abu Dhabi-based Rodel Ayala is Managing Partner and Owner at Rohz Group of Companies. The Legazpi City native has managed lots of projects across the Middle East, including Youth Ministry Council Office for the Ministry of Youth in Dubai, the ADDAX 1211 office interior fit-out, as well as the Off the Hook restaurants in Abu Dhabi and Al Ain. Originally from Plaridel, Bulacan in the Philippines, Dexter Dalisay might be an engineer by profession, but he’s a model and actor by passion. 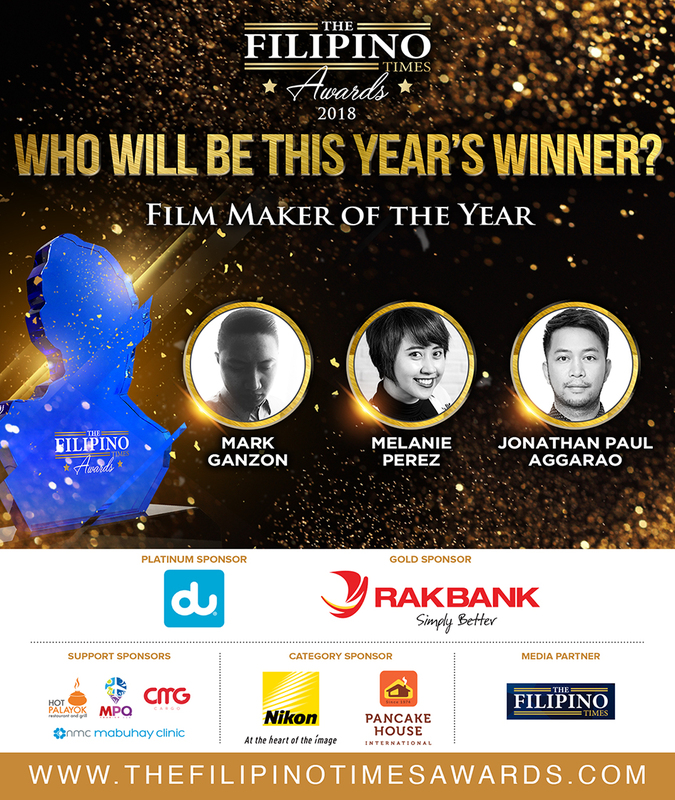 The Sharjah resident has been cast in international films such as Hollywood’s “Twisted Blues”, the Arabic-Hollywood film “On Borrowed Time” as well as the first-ever Filipino full length film in the UAE, “Lamentasyon” directed by 2017 TFT Filmmaker of the year Archie Enriquez. An architect by profession, Dexter Modesto from Bambang, Nueva Vizcaya is a self-taught artist. Currently residing in Dubai, he creates his works of art from recyclable materials and has exhibited his works in Dubai and Abu Dhabi. His visual works focus on the art of collage using mixed media both in oil and acrylic paint. Digos, Davao del Sur native Ivy Grace “Ayegee” Paredes is a professional performer based in Dubai. She went viral following her stint of getting four ‘yes’ votes at X Factor UK in 2016 where judge Louis Walsh praised her performance with a title ‘Little Diva’. 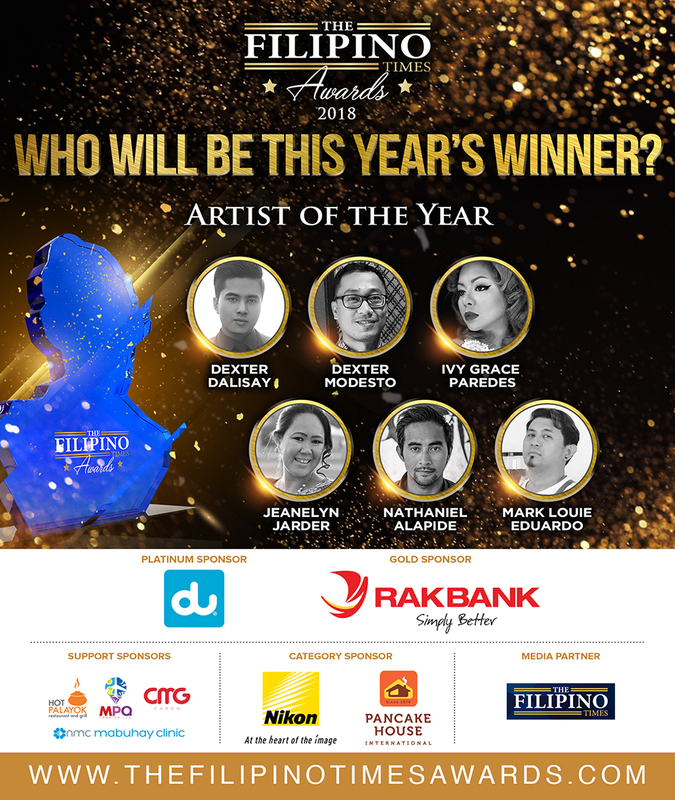 She has also competed in Talentadong Pinoy, Awitanghalan, MetroPop Song Festival, DZMM Pinoy Singing Idol and several more contests in the Philippines and the Middle East. Jeanelyn “Ji” Jarder is a Dubai-based Interior Designer and Visual artist. Originally hailing from Bacolod, Negros Occidental, she has displayed her works of art in various exhibitions and was given the chance to host her very own at Consul General Paul Raymund Cortes’ residence. Mark Louie Eduardo from Valenzuela in the Philippines creates unique art out of coffee. A barista based in Dubai by profession, he has gained awards and recognitions for his artistic take on coffee, from Dubai and South Korea. He has also served H.H. Sheikh Hamdan bin Mohammed bin Rashid Al Maktoum at his workplace in D3. Dubai-based Nathaniel Alapide is a multidisciplinary and self-taught artist known for his sand arts as he creates large-scale murals on the shores of Dubai. Originally hailing from Manila, his work has since been featured in several media and news companies both in Dubai and in the Philippines showcasing and representing his creativity through sand art. Dr. Niño Decenorio from General Santos City in the Philippines is the Vice President of Bath Spa University UAE in Ras Al Khaimah, and international campus of BSU from England in the United Kingdom. He has produced the biggest number of Filipino graduates in the Middle East who obtained their Business and Management Degrees from the United Kingdom. 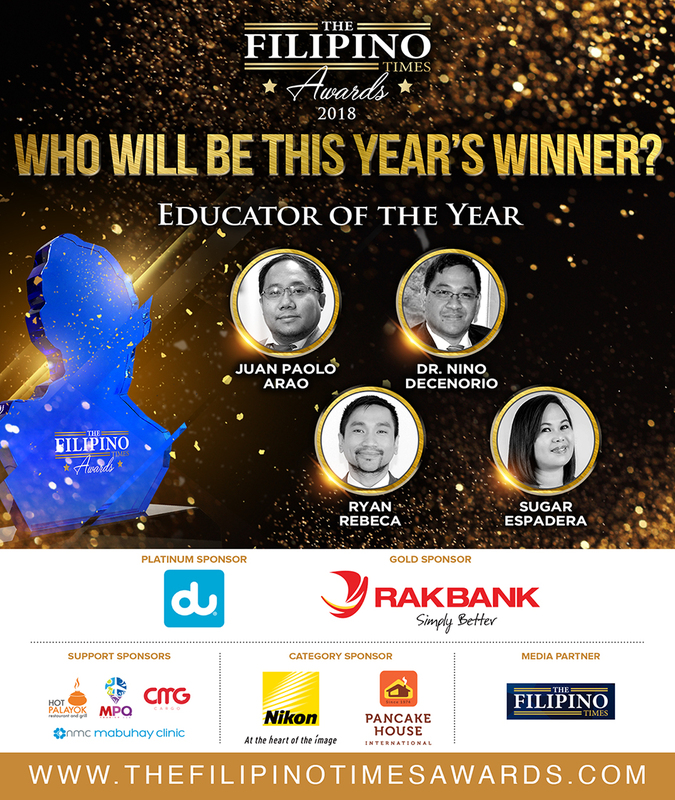 Abu Dhabi-based Juan Paolo Arao co-founded the Filipino Learning Organization that empowers Filipinos to increase their employability as they search for better careers in the UAE. The Manila native has 15 years of experience in HR and learning and has managed to work closely with the government to launch the 1st TESDA Assessment Center in the UAE. Ryan Rebeca from Dubai is currently working as Clinical Educator for Emirates Healthcare group in the UAE. 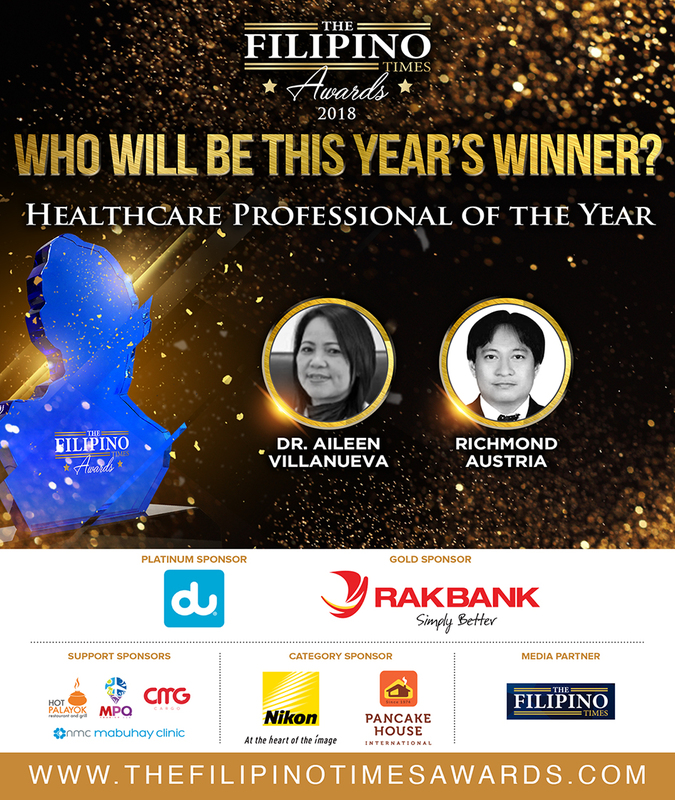 A resident of General Santos City in the Philippines, he oversees training and development of both Filipinos and expats and works closely with the Dubai Health Authority, Dubai Corporation for Ambulance Services and the Department of Health in Abu Dhabi. Sharjah-based Sugar Espadera is founder of Transforma International, a social enterprise that envisions to transform the lives of individuals and organizations through holistic learning solutions. Originally from Bislig, Surigao del Sur, she also provides pro-bono training for leadership, personal branding, and job interview tips for Filipinos across the UAE. Danilo Aquino from Dubai is one of the few engineers working with NORR Group Consulting International, one of the top 100 design consulting firms in the whole world. The Polo, Bulacan native was part of the team behind the creation of The Address Boulevard Hotel in Dubai, The Address Sky View Residence in Dubai, as well as Iran Mall. Abu Dhabi-based Elmer Casao is currently working as a Contracts Specialist at Aafaq Holding and is president of the Bayanihan Council in Abu Dhabi, the umbrella organization of the Filipino Community Organizations in the capital. Originally from Rosario, Batangas, he has over 16 years of combined experience and was instrumental in organizing Abu Dhabi’s biggest Philippine Independence Day celebrations as well as a host of Filipino community events in the capital. Emelyn Martinez, who hails from Legazpi City, is an engineer with more than 19 years of experience and is currently working as an Associate Director at Navigant Consulting in Dubai. She has worked with the biggest names in the UAE and the Middle East such as Arabtec, Saudi Aramco, Bechtel, Samsung Engineering, Emaar, and more. Abu Dhabi-based Jethroefel Ramboyong currently serves as Engineer level-3 at Etisalat with more than 23 years of experience in the field. 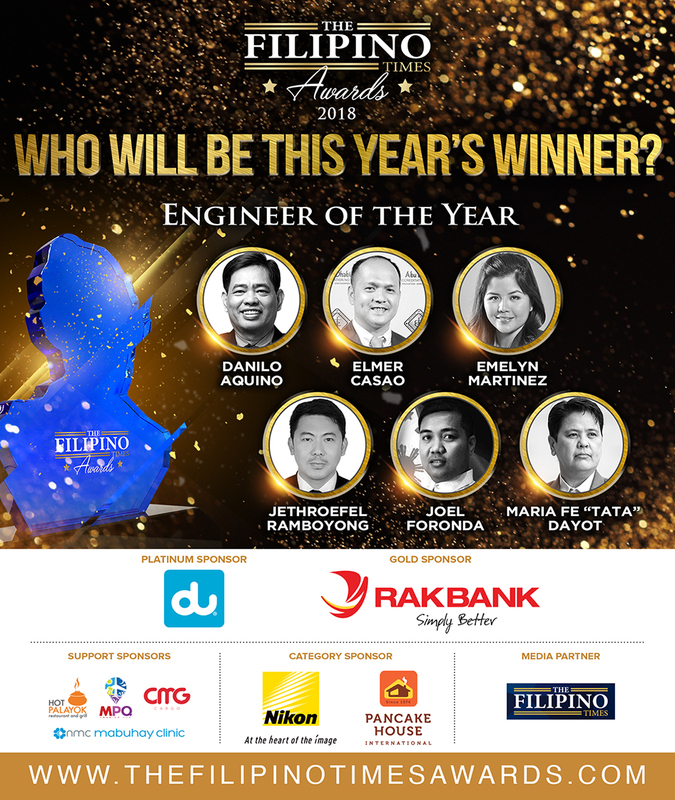 A native of Pampanga, he has received accolades for his support to the community in Abu Dhabi during his 20 years of service to his fellow Filipinos in the UAE, one of which is the 2018 Bagong Bayani Award for Outstanding Employee. He was also one of the founders of the Philippine Professional Organizations in the UAE, the organization that has since produced more than 2000 passers in the Philippine government program – the Special Professional Licensure Examinations. Joel Foronda from Dubai is an engineer with more than 14 years of experience, and is currently working with Plafond LLC, part of the Transguard Group, while at the same time being incumbent chairman of the FilCom, the umbrella organization of the Filipino Community Organizations in Dubai and the Northern Emirates which was responsible for organizing the recently held Philippine Independence Day celebrations at Dubai World Trade Center. 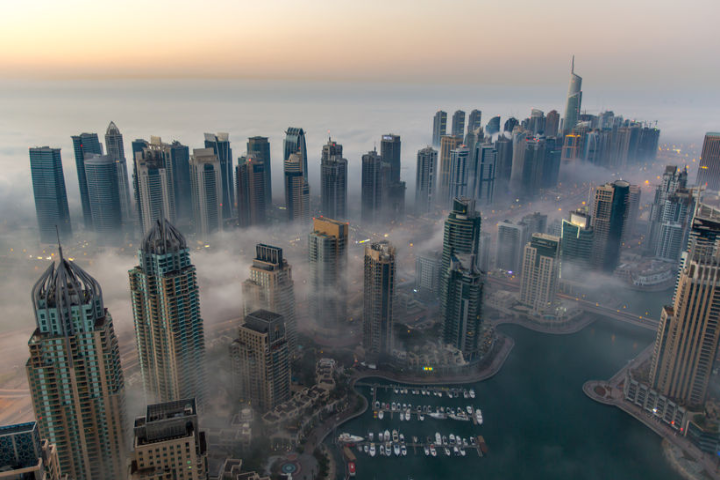 He has worked on huge projects in the UAE such as the HSBC Plaza at Burj Dubai Square, Sharjah English School, Dubai College Expansion, and more. Dubai resident Maria Fe “Tata” Dayot is an engineer with more than 22 years of extensive experience and is currently working as a Project Quality Manager for Arabtec Construction. A native of Butuan City, she has overseen the construction of around 1300 villas in the UAE as well as projects with the Sharjah City Center, Bay Views Hotel, Habtoor Residences, and has served the Filipino community since 2009. She also served as the catalyst to form the Filipino organization in Fujairah, as well as the recognition of Filipino communities in Ras Al Khaimah and Um Al Quwain during her leadership as FilCom chairman in 2017. Fujairah-based Cristina Calaguin is the Executive Director of Dagaz HR Consultancy and Recruitment Company. Hailing from Manila, her company is a social enterprise that enables people with disabilities (PWD) find jobs in Dubai and the UAE. Jeffrey San Juan from Dubai is the Founder and Partner of two firms: Quatro Verde Technical Services and San Juan Engineering. The Dolores, Abra native oversees the comprehensive interior design and decoration services for residential and commercial establishments in the UAE. Dubai resident Michelle Guinto is a Partner at CMG International Movers and Cargo Services. Hailing from Trece Martirez City with humble beginnings as a smoked fish child vendor, her company now aids Filipinos get their balikbayan boxes home safely to the Philippines. 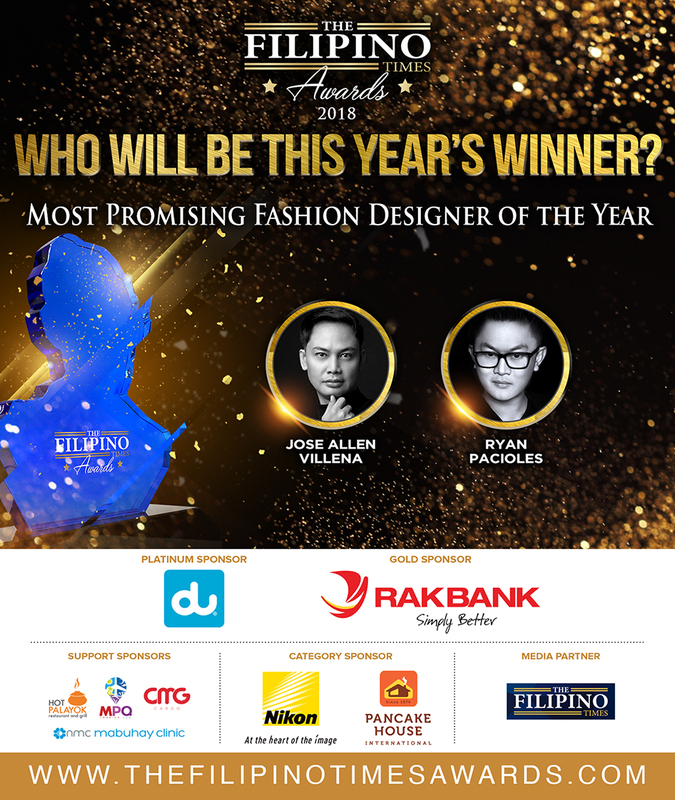 Jose Allen Villena from Abu Dhabi is the owner of Bella Donna Haute Couture and has been working in the fashion industry for more than 24 years. A native of Zamboanga City, he has served as the in-house fashion designer for the Royal Family in the office of Sheikh Mansour Al Nahyan and has provided training for distressed OFWs in the UAE to help them launch their own businesses. Dubai-based Ryan Pacioles is a self-taught fashion designer who currently serves as the Creative Director and Manager at Atelier Zuhra. Originally hailing from Leyte, his fashion works has been worn by famous celebrities such as Regine Velazquez, Carla Abellana, Dennis Trillo, Solenn Heusaff, and more. Mark Ganzon from Dubai is Founder and Creative Director of Vizfolk Media under Brag Plus. The Manila native has been working with Vogue Middle East, has created film campaigns for the Fashion Forward Season 10 edition, and has created a Fashion Film Collaboration with Lindsay Lohan for Emirates Woman. Dubai-based Melanie Perez is CEO and Founder of The Melrish Studio which has been in operation since 2009, filming and directing more than 50 wedding videos. Hailing from Manila, her film “Aurora” in 2016 and “Girl Next Door” in 2017 has received many accolades in the UAE and in London. Jonathan Paul Aggarao from Dubai is Art Director at Q&A Advertising. 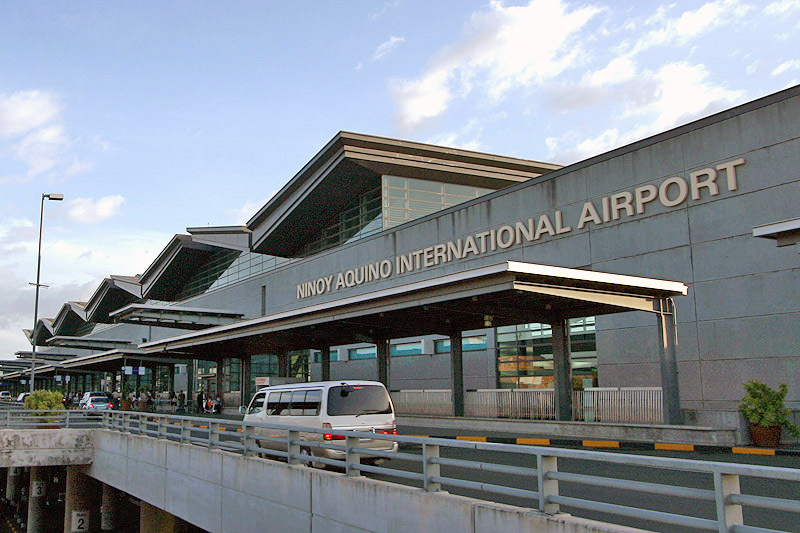 A native of Manila, he has worked on films for different parts of the globe, such as the SEMA Las Vegas worldwide event in 2017, The Travel Hub for Istanbul, Turkey Travel and Tourism, and the Sri Lanka Nikon NPM Photo/Video tour. Abu Dhabi-based Dr. Aileen Villanueva is a General Physician at NMC Day Surgery Center with over 27 years of practice in medicine. Originally hailing from Taguig, Rizal, she heads the NMC Mabuhay Clinic department, catering to the needs of the Filipino community in Abu Dhabi. Richmond Austria from Abu Dhabi is a Senior Performance Management Officer at the Ambulatory Healthcare Services with over 11 years of experience in managing healthcare performance improvement projects in the Middle East. A native of Pasay, Metro Manila, he leads in the development of organization improvement projects as aligned to the SEHA Strategy for 2015-2020. Daryl Bismanos from Abu Dhabi currently serves as Assistant Chief Concierge at St. Regis Saadiyat Island Resort. Hailing from Magsaysay, Davao Del Sur, he has been featured in the Concierge Magazine and has received recognitions in the UAE. Dubai-based Eileen Guerra works as Cluster Assistant Director for Sales for City Seasons Al Hamra Hotel and Royal Rose – a five-star Hotel in Abu Dhabi. A native of Pateros, Metro Manila, she managed to climb the corporate ladder to be recognized as one of the Top Sales Producers, bringing revenue despite the tough market conditions. John Martho Buenaventura from Dubai is the CEO and Culinary Director at Cuisinero Uno Restaurant in Steigenberger Hotel. 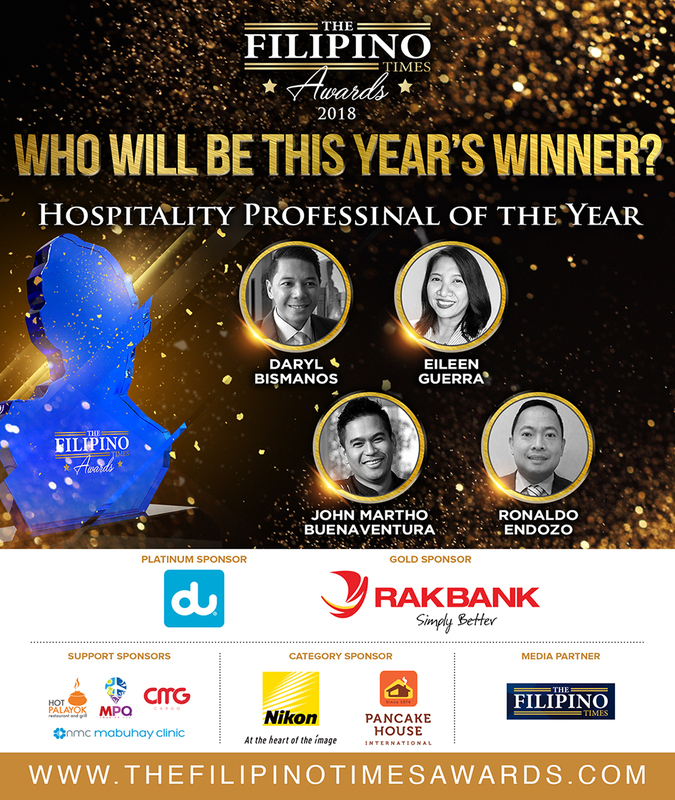 Originally from Metro Manila, he has served the Crown Prince of Dubai, His Highness Sheikh Hamdan bin Mohammed bin Rashid Al Maktoum, and has been receiving awards and recognitions for his service in the field of hospitality for the past 10 years. Ronaldo Endozo from Candelaria, Quezon in the Philippines is the Operations Manager at Fraser Suites in Dubai. He has over 24 years of experience in the Food and Beverage industry, leading the conceptualization and opening of over 40 international restaurants and 6 pre-openings of hotels in the Middle East. Marie Dominique Famador from Dubai is the Brand Manager for Tag 91.1, the only Filipino radio station in the country at the Arabian Radio Network (ARN) since its maiden broadcast. Originally hailing from Parañaque, she was instrumental for the launch of the first Filipino radio station in the UAE. She’s the only Brand Manager to date to have received the ‘Star of the Quarter’ in 2015 from the Arab Media Group. Dubai-based Eduardo Almeda Jr., is an Events Assistant Manager for Azizi Developments. 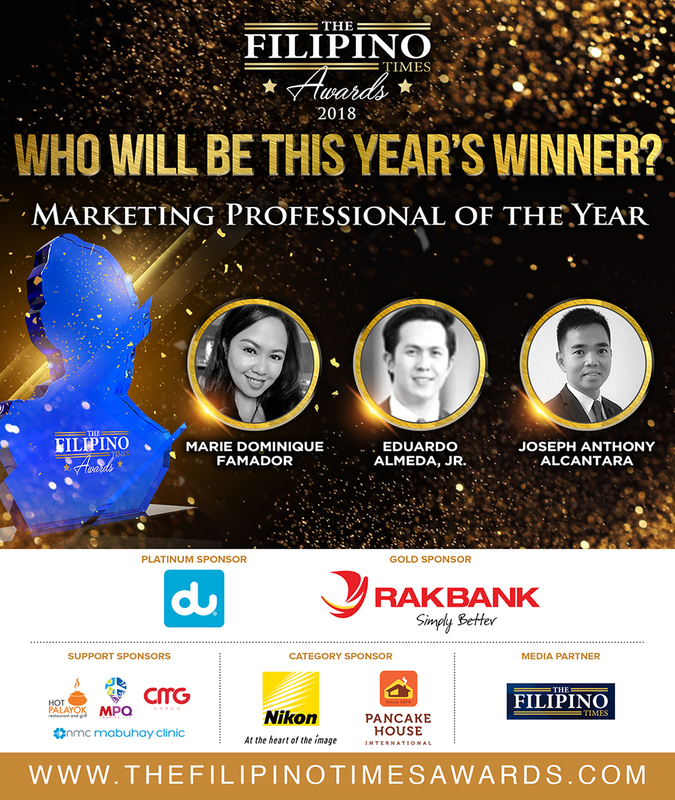 A native of Manila, he has climbed the career ladder from being Marketing Coordinator where he was recognized for his strengths in events creation and planning for both local and international events which included the Dubai Property Show, the Cityscape Abu Dhabi, International Property Show, and more. Joseph Alcantara from San Pablo City in the Philippines is the Marketing Communications Manager for Emirates Airlines in Dubai. From conceptualization to implementation, he has led fully integrated marketing communication plans to meet the brand building and commercial objectives of his markets which include the GCC – UAE and Oman, Southern Europe – Cyprus, Greece, Malta, and Turkey. Cleofi Krista Capili from Dubai is currently one of the hosts of the Filipino online magazine show ‘Halo-Halong Kwento’ on Gulf News. Originally from La Paz in Tarlac, her program covers the trendiest, most relevant matters of OFWs in the UAE and has spearheaded the production of its pilot episode titled ‘Filipino moms miss graduation day’, an emotional tribute for successful Filipino mothers. Dubai-based Anna Louise Da Costa is the Programming Director for Tag 91.1. She has worked in radio all her life, and was the only Filipina working for the Arabian Radio Network (ARN) before Tag 91.1 was launched. She has since won several accolades for her service in the UAE’s radio industry and is now an ambassador for a number of trusted brands in the country. Stephen ‘Steve’ Patrick Moore from Dubai works as a TV Presenter for Physique TV and as a freelance events and sports announcer and writer. Hailing from Quezon City, he has been chosen as the main event host for the FIFA World Cup Beach Soccer in the Bahamas and is currently working as one of the main hosts for GMA 7’s Trending Pinoy, reaching MENA, Europe and the United States. Dubai-based Josie Conlu is one of the administrators and hosts of “Tatak Pinoy”, a Facebook page launched by 2017 TFT New Media Personality of the Year Enrico Cardoniga. 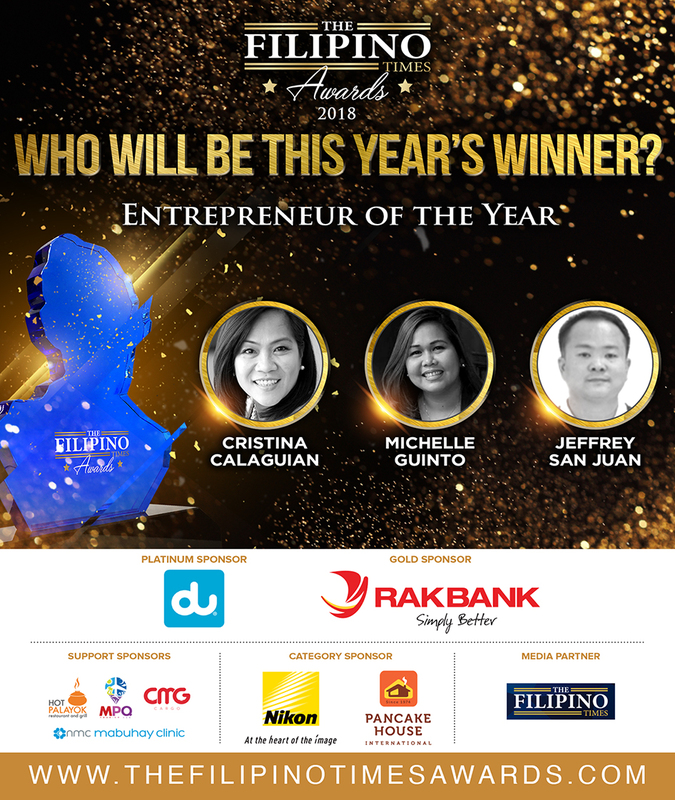 A native of Bacolod City, she has since featured Filipino achievers, entrepreneurs, the hardships and the success stories of Filipinos in the Middle East and is an active civic leader of various Filipino organizations in Dubai and the Northern Emirates. Ma. Kristina Grace Carpio from Dubai, better known for her blog ‘SmileLikeNina’, is known for her passion in blogging about travel, fashion, and beauty. A native of Manila, she has created vlog series such as the “Morena Makeup series” which aim to show how Filipinas can embrace their inner beauty, as well as her “Fashion Forward Vlogs” and “Korean Skin Care” videos that show how Filipinos can create unique looks and become more fashionable. Dubai-based Roy Lance Japor, also known for launching “DuBlog,” has been helping Filipinos in the Middle East with his vlogs by banking on his experience as an HR expert. Hailing from General Luna in Quezon, his weekly “DuBlog HR Corner” talks about the proper way of applying for a job. It also offers guidance on topics such as end-of-service or gratuity, visa processing, labor law, and other HR topics. 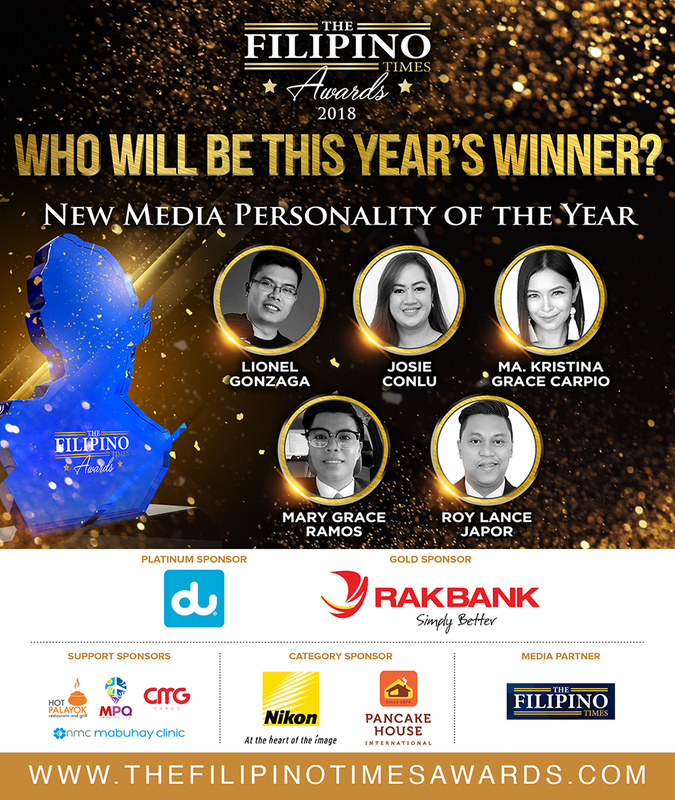 Mary Grace Ramos from Dubai is founder of “Proud Pinoy Media” and is also the partner at “PinoySmile Dubai Media.” Originally from San Juan in Metro Manila, her PinoySmile Dubai platform is a Lifestyle, News & Media outfit that showcases the uniqueness of the Filipino culture through the Filipinos’ love for food, dancing, singing, sports, and shopping. She has been instrumental in launching several volleyball sports fests in Dubai and the Northern Emirates. Abu Dhabi-based Anthony Austria is a multi-awarded professional photographer who has received recognitions in the Philippines and the Middle East. The Manila native’s eye for photography has been featured worldwide in magazines, books, and other publications in Australia, UK, Tokyo, Malaysia, Middle East and the Philippines. Christian Malvar Calumberan from Dubai is the owner of Chris Calumberan FZE for Photography services and an ambassador for leading photography brands such as Fuji Film, Henzel, and Jinbei. Originally from Mandaluyong in Metro Manila, he specializes in commercial photography for advertising and magazine editorials and has won accolades for this works in the Middle East. Dubai-based Gabriel John Rimando is founder of Kabayan Kamera Klub and the Filipino Camera Club in the Middle East. A native of Baguio City, he teaches photography and is CEO of the Filipino Institute where he guides fellow Filipinos to learn photography techniques and other life skills. He also organizes photography events for charitable purposes in the UAE. Roger Alfonso is a photographer from Dubai who’s part of the Filipino Food Service Community. 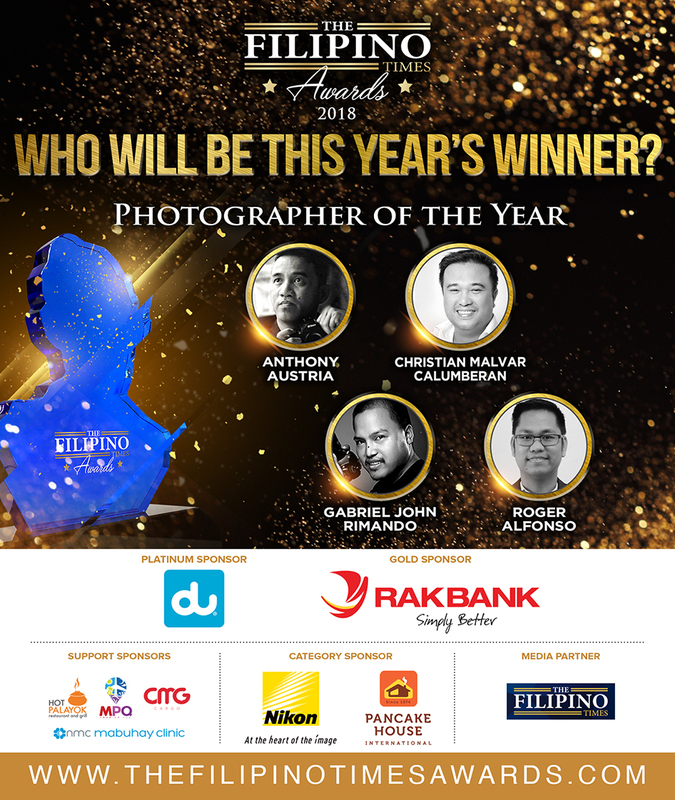 The native of Guagua, Pampanga has won several awards in the Middle East for his photos that capture the right moment, taking photos from Malaysia, Thailand, India, the Philippines, and the Middle East. Francis Errol Medina from Dubai is the Head of Stategic Marketing and Business Improvement at Hilti – Middle East, Turkey and Africa (META). The Makati native is the only Filipino expat in the Senior Line Management Team of Hilti and has been known as “Mr. Expat Entrepreneur”, guiding fellow OFWs by conducting financial literacy seminars to open up their entrepreneurial spirit. Dubai-based Hashim Guinomla currently serves as the Assistant Vice President for Investor Relations and Research in Dubai Islamic Bank. Originally hailing from Manila, he is one of the few Filipinos in the top management and was instrumental in launching a dedicated strategy and investor relations team in DIB. His passion in bowling drove him to launch The World Overseas Filipino Bowling Tour (WOFBT) which has showcased the capabilities of Filipinos in the UAE in bowling. Jesus Metelo Arias is the Vice President for Marketing, Sales, and Service at Ford Motor Company in the Middle East and Africa. With the skills that he has shown over the years, he has earned the trust of his company and managed the operations of Ford in other locations around the globe including Japan, Thailand, China, Vietnam, and India. He is known for establishing the Ford organization in ASEAN (Association of South East Asian Nations) as well as the launch of Mazda in the Philippines.